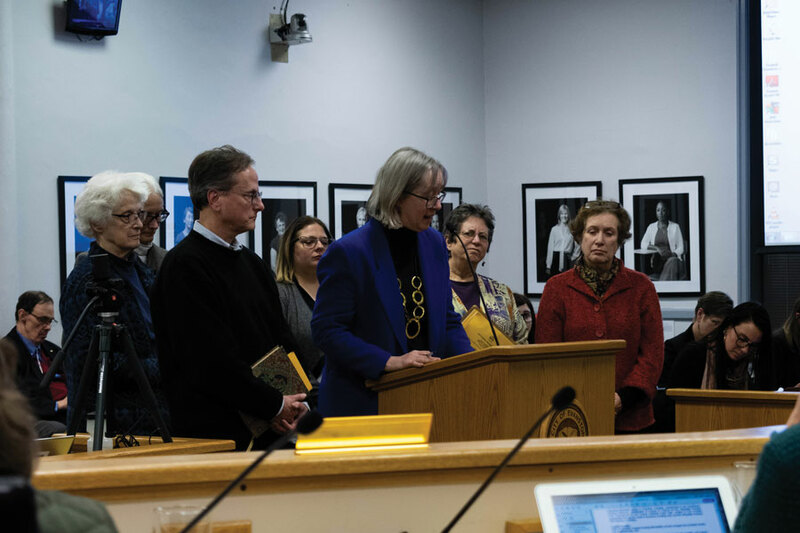 Evanston residents speak about affordable housing at a special City Council meeting Monday. Aldermen discussed two proposed developments with affordable housing units. Aldermen considered new affordable housing development plans which would serve seniors and mixed-income households. In a unanimous vote at Monday’s special City Council meeting, aldermen approved a letter to the Illinois Housing Development Authority, expressing support for an affordable senior housing development. The developers, Evergreen Real Estate Group and the Council for Jewish Elderly, proposed a 60-unit building with elevator access at 1015 Howard St. Aldermen also tabled a redevelopment request of a city-owned property at 506 South Blvd. The site on South Boulevard is currently a parking lot known as “Lot 1.” Ald. Melissa Wynne (3rd) said she had received phone calls from residents and asked for further discussion about the development before moving forward. Families will pay 30 percent of their income, and the remainder is subsidized in units reserved for low-income households, according to city documents. Additionally, median-income households will pay 50 to 80 percent of their income. Units will range in size to serve various household sizes, according to city documents. The senior housing development would be age-restricted with primarily one-bedroom units, Evergreen director of development David Block said. Rent will either be fixed at an affordable rate or require tenants to pay no more than 30 percent of their household income, he said. Evergreen currently manages over 8,000 units in 13 states. CJE has provided senior services, with a large clientele based in Evanston, and it currently runs adult day services at the development site. Block said the developers were interesting in helping Evanston residents. Ald. Judy Fiske (1st) expressed support of this priority. The letter from the City will supplement the developers’ application to the IHDA, due on Feb. 15. The developers will ask IHDA for over $14 million in low-income housing tax credit equity, $450,000 in donation tax credits and $2 million in soft funds, according to city documents. Ald. Ann Rainey (8th) said IDHA has already expressed “overwhelming support” in the pre-application process. The letter commits $2 million from the city to fill the gap in financing, according to city documents. However, Ald. Peter Braithwaite (2nd) expressed concern over making such a commitment “in one swoop” without knowing where the money will come from. City staff determined home funds and affordable housing funds were likely sources but agreed to look at other sources to acquire the money. Rainey said the offer of 60 affordable units “would never be offered again” and has “never been offered before.” She asked why they were “twiddling our thumbs” over the details.